When Jane Stafford (Hurshman) was taken into custody for killing Billy Stafford with a shotgun, the police sergeant who interrogated her was heard to remark: “She deserves a medal.” He didn’t know the half of it. Life With Billy tells, often in Jane’s own words, not only what happened, but why. It’s the story of a woman who could see only way out of a living hell—and she took it. 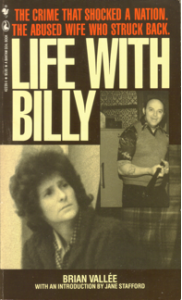 This is the original edition of Life With Billy. There is a limited number of new copies available from the author. Upon request, books can be signed personally to the buyer or as a gift to a third party.